April, 2012 I attended a concert at the MIM in Phoenix Az. Great concert with performances by Lewis Nash and Wynton Marsalis. Attending the concert, unfortunately not performing, was one of my musical idols. 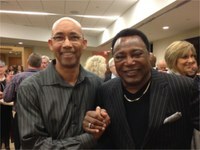 After the show I was able to meet George Benson. In my early days trying to teach myself jazz guitar, I spent countless hours trying to emulate the jazz licks of Mr. Benson. Meeting him was a real thrill. That is likely obvious from my huge grin in the photo. George was very nice and accomodating to a fan. Great musician. Nice man. We chatted, apparently looking like old friends from the comments of others. In a way, I did feel like we were old friends considering the amount of time I've spent enjoying and studying his music. George went so far as to suggest we should "hook up" sometime. In shock, that my idol was suggesting such a thing, I babbled on about something or the other. I regret to this day that I did not take him up on the offer. DOH! !